Water Cycle is a short experimental film that explores human interaction with freshwater ecosystems. I collected plastic, sand, and moss from the New River and taped them to clear 16mm film leader in homage to Stan Brakhage’s experimental filmmaking. The soundtrack is a mix of field recordings from the river’s headwaters on Snake Mountain, North Carolina to its mouth in Gauley Bridge, West Virginia. My family lives on a small farm on the north fork of the New River in Ashe County, North Carolina. The headwaters ecosystems in our backyard are crucial to protecting water quality, as pollution deposited here affects life many miles downstream. Water Cycle was inspired by my experience participating with river clean ups. Projecting the plastic pulled from the river on the big screen asks the audience to pay attention to their connection to the fresh water ecosystems that sustain us. Keep Your Eye upon the Scale is a documentary collaboratively produced for Southern Spaces by Tom Hansell, Patricia Beaver, and Angela Wiley. 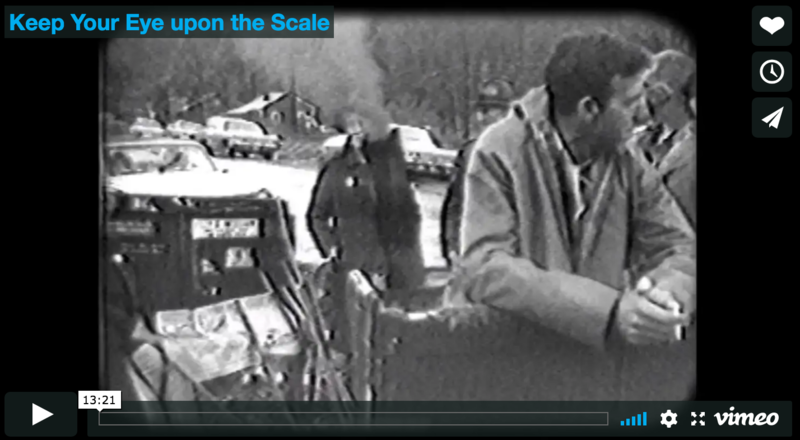 This short video features previously unpublished footage recorded by Helen Lewis, John Gaventa, and Richard Greatrex as part of their project to document the cultures of Appalachian and Welsh mining communities in the 1970s. Featured performers include Appalachians Rich Kirby and The Strange Creek Singers, as well as Welsh male choir Cor Meibion Onllwyn. It can be viewed from the Southern Spaces online journal.